Learn how to make a potent, bright-pink colored concoction that tastes like the cereal milk after enjoying a big bowl of Frankenberry Monster Cereal! 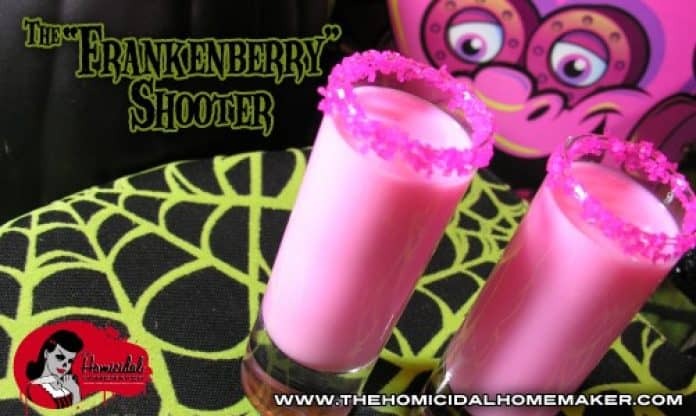 The Frankenberry Shooter is like a grown-up version of cereal milk! For as long as I can remember, I have been a huge fan of the Monster Cereals. Boo Berry holds a special place in my heart, but Frankenberry is the favored monster among many of my friends. After some experimenting with a few different flavor combinations, I realized I had created a drink that was not only Frankenberry-colored, but tasted like an alcoholic-version of the very sweet cereal milk a bowl of Frankberry leaves behind. This potent, bright-pink colored concoction is best served in a tall shotglass, or in test-tube shotglasses if you can get your hands on them! Try this Frankberry shooter and watch your tastebuds come aliiiiiive! NOTE: Because of the high alcohol content mixed with the creme liqueur, the mixture will begin to separate from the milk if sitting for a few minutes, giving the appearance of ‘curdling’, so drink fast! Combine all ingredients in a cocktail shaker filled half-way with ice; shake for about 10 seconds, and strain into two tall shooter glasses. Drink fast, and enjoy!